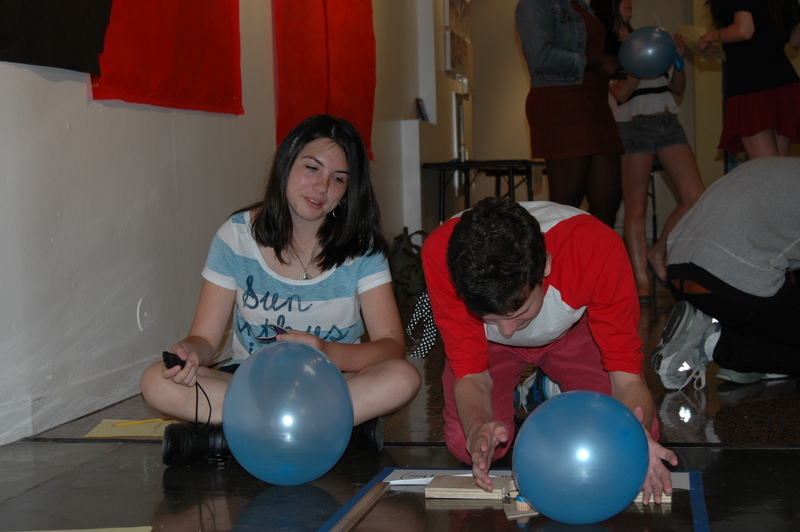 Division Three students test theories around friction with handmade balloon cars. If you came to the gallery at the middle and upper school campus looking for art this morning, you may have been a little surprised to find science living there instead. Andrew Lapin’s Division Three (9th and 10th grade) conceptual physics classes had converted the space into a make-shift lab to test their theories and assumptions about friction. 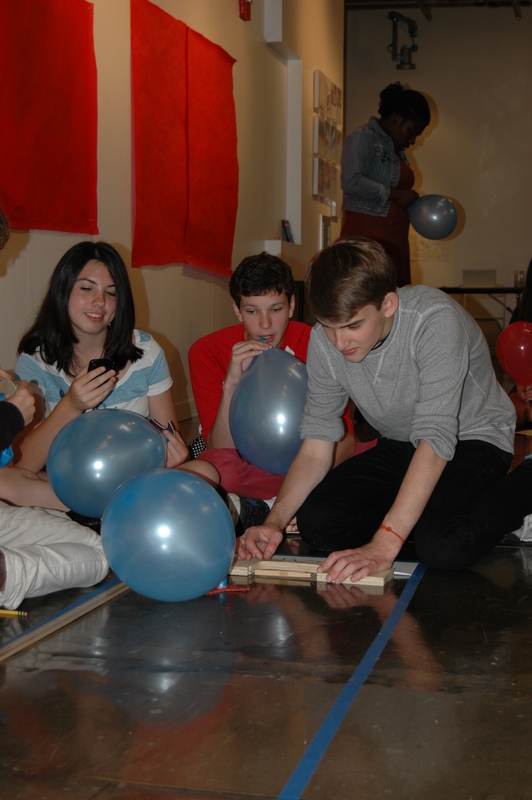 The assignment was to craft “balloon cars” that students would send down one of two tracks and measure the time and distance of the car’s travel. They had to come up with a shape, cut it out of a thin sheet of wood, drill a hole in the center, attach a balloon, blow up the balloon, then send the car off with stop watches and meter sticks at the ready. The tracks were long, narrow alleys of concrete floor marked off by blue tape. One track had a smooth plastic sheet that ran down the length. Each student had to align his or her car in a launch device made out of wood and a rubber band. A peer with a timer would countdown 1-2-3, then zip! Off the car would go. A student prepares his balloon car for take-off. Students dutifully recorded their results on lab sheets, and will spend the next few days working on formal lab reports. The lesson is part of their study of Newton’s Laws of Physics. But it’s much more than that, says Andrew. Andrew had strategically placed himself at the very back of the room. Kids were sprawled on the gallery floor and barely noticed him; they were completely focused on the task at hand. If they had a question, there was always another student nearby who helped out with an answer. And if they were really stumped, Andrew was ready to jump in. The morning provided a perfect example of student-centered education, where teachers serve as coaches and kids take responsibility for their own learning. Students compared their designs and collaborated on ideas. The teamwork was impressive and the learning was genuine. NASA recruiters, please take note!